When I heard that the lovely charity Smile Train were looking for a final member to join Team EMPOWER for the 2016 Brighton Marathon, I was quick to sign up! My family has supported the charity for a number of years, and I’ve always been impressed by the fantastic work they do. I’d recently completed the Great North Run in September and so the small matter of running 26.2 miles seemed like the appropriate next step. So there I was, sat at my desk on a January afternoon feeling the need to get motivated post-Christmas binge, and signed up to run my first marathon. With the run just a couple of months away and having not much of an idea as to what the training entailed or just how much of a challenge it would be, I was feeling suspiciously optimistic. However knowing that I would be raising money that would go towards the great work that Smile Train carry out was all the motivation I needed, and from then on out it was (pretty much) smiles all round. Smile Train, the world’s largest cleft charity, is dedicated to helping the millions of children in the world who suffer from cleft lip and palate through providing free surgery and follow up care, and free training for medical professionals to promote sustainability. As a valued client of The PHA Group, I’ve been able to see just how dedicated Smile Train are to helping millions of children in developing countries. Their work is sustainable as it provides training and funding to empower local doctors in 85+ developing countries to provide 100%-free cleft repair surgery in their communities. The results achieved by the charity are staggering. Following the simple surgery patients are able to breathe, eat and speak without any problems and most importantly see their smile for the first time. The shame and stigma associated with cleft lips and palates are also solved, meaning that the operations that Smile Train facilitate really do change lives and communities forever. 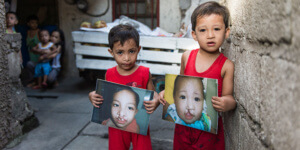 Mark and Prince following cleft lip and palate surgery carried out by doctors trained by Smile Train. Training for a marathon is a gruelling and time-consuming task, but it is very rewarding. I knew that I was perhaps a little behind the normal marathon training schedule, so I was determined to kick-start my training and get in as much running as possible in the 12 weeks I had. I managed roughly four runs per week and I tried to go for longer runs on my days off. 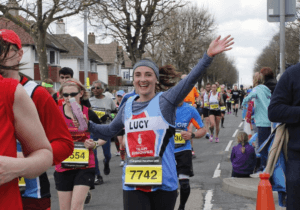 I signed up for an official training run (Lidl Kingston Breakfast Run) a couple of weeks before the marathon – which was really helpful – and I kept chatting to colleagues who were also in training (mostly for this weekend’s London Marathon). In terms of fundraising, I took advantage of Easter falling a couple of weeks before the marathon season and the opportunity to bribe my friends, family and colleagues with chocolate treats in return for donations. I used this very effective sugary-tactic a number of times, and it really was fail-safe in terms of bringing in those generous donations. Nothing says ‘Please sponsor me’ better than ‘Please sponsor me (oh and there are cupcakes on my desk)’. If I could give any advice to those considering taking on a marathon, it would be to keep pushing your limits but make sure you’re still having fun. By this I mean push yourself to go those extra few miles on the weekend (or whenever you have a day off to train), but make sure you’re still enjoying yourself by bringing along a friend sometimes or treating yourself to a nice big burger afterwards. Most importantly, if you’re running for a charity, keep them at the forefront of your mind and remember the positive difference your fundraising will make. Particularly as you hit those final few miles and you may be wondering what made you willingly sign up for this!